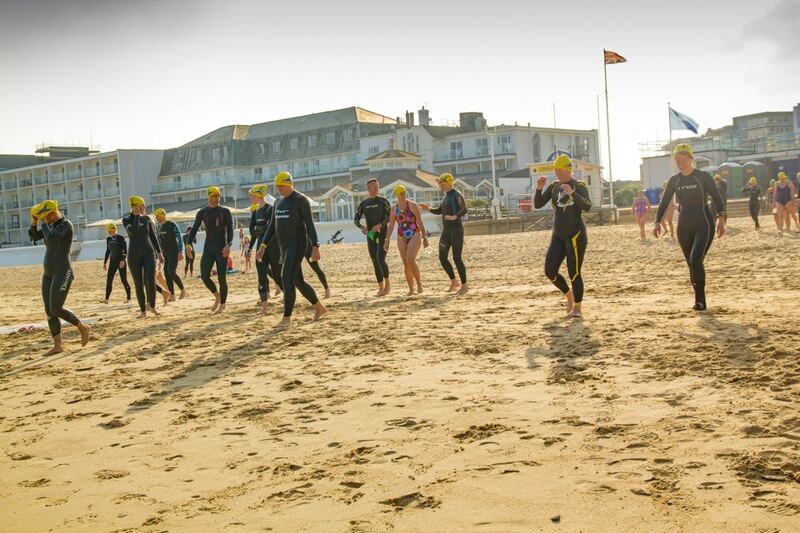 During a normal club session we may set off from Shore Road and swim either towards Sandbanks or towards Bournemouth depending on tide and weather. When swimming to Sandbanks it is not advisable to swim beyond the lifeguard hut as at certain tidal stages strong currents can be experienced pushing swimmers toward the entrance of Poole Harbour. We meet at 6pm. On arrival swimmers register and take a numbered wristband. There's a quick briefing at 6.15pm where we discuss weather and tides and make any announcements. We normally swim for just over an hour. Lifeguards in kayaks accompany our swimmers on a Tuesday session. A more informal session, we meet at 9am. Anybody is welcome but less experienced swimmers should be aware that there's no kayak support for Sunday sessions. We still register swimmers and encourage swimmers to follow normal open water swimming safety guidelines and to buddy up. The majority of swimmers wear yellow hats and swim within the guidance of the briefing and are afforded safety cover by kayaks. Some experienced swimmers, especially those training for long distance events, may start their sessions early and swim further. They sign a disclaimer and are not afforded safety cover. Worn by swimmers doing a taster session.